If you’re an avid biker, you’ve probably encountered the problem of running out of space for extra items like repair kits and pumps. Enter the bike trailer. Made to haul cargo or take along kids on a trail ride, bike trailers make it easy to haul anything you want or need. In this piece, we’ll cover what to look for when shopping for the best bike trailer and share our top picks. This WIKE trailer is both aesthetically pleasing and feature-packed, making it a great pick for carting around your kiddos. The top-of-the-line pick. This trailer has won design and safety awards for its durable-yet-lightweight design. Great budget option thanks to its compact design and sturdy frame. Ideal for bringing along in the car. Built for transporting different types of cargo, this Schwinn trailer rises to the occasion for long trips. A perfect pick for bringing along your furry companion, this trailer will create a safe and enjoyable ride for your pet. Space for two kids, five-point safety harnesses, tons of storage space, and quick hitch attachment. Rollover protection, five-point padded harnesses, parking brake, reflective, waterproof canvas, bug screen, and adjustable suspension. Tinted side and rear windows, ventilation, squishy wheels, safety flag, and a sturdy tow hitch. Handles large loads effectively, folds flat for storage, and comes with a universal coupler for different bikes. Internal adjustable leash, rear doggy door, durable steel frame, safety reflectors and flag, adjustable bug screen, and a universal coupler. High price might be too much for a basic trailer. Expense makes this one more of an investment. Difficult to assemble and store when not in use. The canvas can rip from bad weather or rough riding conditions. Stability is an issue with larger, top-heavy pets. 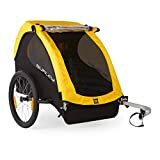 Why Buy a Bike Trailer? Great cardio. Riding a bike is a great low-impact cardio workout. Burning around 120 calories for 20 minutes of riding, it’s a calorie torcher that tones your legs and improves your overall fitness level. Build stamina and muscle strength at the same time. Building on the amazing benefits of bike riding, add a bike trailer and occupant to the mix to really boost your workout. The added weight helps strengthen your core, legs, and glutes and does wonders for your stamina. Bond with your little ones. A bike trailer is a great option for taking along your kids, especially if they’re still too young to ride a bike. Likewise, you can take kids on longer rides without them tiring out. Cargo space galore. If you want to take along more equipment or things that just won’t fit into pannier bags, a bike trailer is a convenient option. You’ll be able to take along everything you need with minimal effort and lots of stability during the ride. This is the most common option, made to transport one or two small children. They tend to be limited to a specific age group, usually topping out at eight years old. Most models come with some sort of screen or rain cover to protect your little ones from the elements and bugs. Some even convert into jogging strollers you can push yourself. Pet trailers are similar in design but tend to be smaller. As the name suggests, cargo trailers are made to haul equipment, groceries, or whatever else you might need to carry around. Their shape, available in numerous sizes, tends to be more square or rectangular in order to maximize space. They often use smaller wheels to remain lower to the ground for better aerodynamics as well. A two-wheel setup is the most common on bike trailers, but various types exist. Single-wheeled trailers are somewhat uncommon but are suited for road use and single-track terrain. Founded over 70 years ago in Malmo, Sweden, Thule has been making high-quality cycling products from the beginning. Among their most popular products are the Chariot Cross and Cadence 2 bike trailers. Headquartered in Eugene, Oregon, Burley Design was founded in 1987 with the goal of making great products for the cycling market. The Bee and D’Lite trailers are among their most popular models. $100 and under: This is the basic budget model range. Bike trailers in this category don’t have a lot of fancy features and tend to be a little less durable. In most cases, advanced safety features are also lacking. $100 – $500: At this price point, you’ll find a variety of mid-range models and multi-sport options. For the most part, they use durable materials and have a rugged construction that can take a few bumps in the road. Features are also more plentiful. $500 – $1000: These mid-range and high-end models offer more storage, better suspension, and more advanced safety features. Overall, they’re more durable because they use better materials. $1000 and above: This range is similar to the previous price category in terms of storage, suspension, and durability, but comes with additional convenience features and safety accessories. When shopping for your new bike trailer, make sure that the interior fits your needs. That means there should be plenty of space for kids and/or cargo and important safety features. Safety straps are important to keep your little ones secure. Interior pockets are useful for keeping toys and books in place. Check that the trailer hitch works with the frame of your bike. It should fit securely at the rear. A number of models attach to the axle of the rear wheel instead of the frame, which offers a more universal fit for most bikes. Most bike trailers have 14- to 20-inch touring wheels for speed and efficiency. Different bike trailers have different sets of convenience features. Most tend to offer protective accessories like rain covers and sun shades to keep kids dry and comfortable, organizational dividers for cargo and toys, and even a parking brake. Other safety accessories like flags and reflectors increase the visibility of the trailer. Better suspension can also smooth out the ride on rough terrain. Intended use: Depending on whether you’re hauling cargo or toting kids around, some bike trailers are better suited to one use or another. If you tend to go on longer bike rides, you may want a cargo trailer to take along extra items. Likewise, if you’re heading into town with the kiddos in tow, a typical bike trailer will get the job done. Safety: All bike trailer models should come with a basic set of safety features to keep your little passengers safe. That means straps or seat belts for children, cargo straps for larger items, and a safety flag for better visibility. Bike type: The trailer’s hitch design will affect its compatibility with different kinds of bike frames and wheels. Wheel-mounted hitches have near-universal compatibility with most bikes. Most upright bikes tend to be compatible with the most common bike trailer brands as well. Recumbent bikes and trikes can have issues with frame-mounted designs depending on the shape of their rear frame. Specialty bikes like unicycles, penny-farthings, or quad bikes are unlikely to work with traditional bike trailer hitches. The WIKE Moonlite trailer isn’t only aesthetically pleasing, it delivers in all the important areas. Overall, this is a great pick if you’re looking for a trailer that can carry one or two kids. It also has tons of storage space under the seat and a deep storage pocket in the back of the trailer. The flooring is made from hard plastic to shield your kiddos from the elements. Two five-point safety harnesses keep your children safe. The hitch design also makes it easy to attach and detach the trailer quickly to any bicycle with just one lock. The only downside to this trailer is the high price point. Other trailers offer similar features and capabilities for a fraction of the price. But, it’s durable, well-made, and a great option if you want a mid-range trailer that’ll last. If you’re looking for the best value option, the Burley Bee is the smart choice. Its compact design allows it to fold flat when not in use, making it ideal to take along in the car. Tinted side and rear windows, as well as some rear ventilation, all keep your child protected from the elements. As far as budget trailers go, this one is durable and well-made, so you needn’t stress over your kid’s safety. The 20-inch wheels offer a super smooth ride. A hitch and tow arm come with the set along with a safety flag. A minor downside to this particular model is the assembly difficulty. Unless you keep the trailer together in between rides, you may spend some extra time getting everything ready compared to other trailer options. The Hamax Outback Multi-Sport trailer is among the best for children. It’s a safety-certified design winner that’s durable and lightweight. The frame uses high-grade aluminum to offer ultimate rollover protection. Additional safety features include padded five-point safety harnesses, a parking brake, reflective, water-resistant materials, and a bug screen. Suitable for a variety of terrains, this trailer comes with adjustable shock suspension for a smoother ride. The seats are padded and feature adjustable headrests with built-in neck support. Finally, the interior is spacious and comfortable with rubber-lined mats to make cleaning easy. This trailer can also be used as a stroller or jogger. The only downside to this otherwise amazing pick is the high price point. With so many extra touches, the price tag reflects the added value the trailer offers. Given its top-of-the-line features, this is truly a worthwhile investment. This Schwinn cargo trailer is built to handle big loads. The wide frame provides a large towing and storage capacity, while the two-wheel design limits the stress placed on the bicycle while riding. The frame folds flat, and the wheels have a quick release for easy storage in between rides. A universal coupler allows this trailer to fit with virtually any bike. The wheels have molded rims to keep the tires on in rough terrain. Interior D-rings in each corner of the trailer allow you to strap down whatever you’re transporting for extra security. One minor drawback of this trailer is the canvas that can rip from external stresses like bad weather. To make the most of this trailer, consider an additional cover to prevent tears. Otherwise, this trailer is the ideal pick if you’re looking to transport cargo. A perfect pick for bringing along your furry companion, this trailer will create a safe and enjoyable ride for your pet. An internal leash keeps your pet safe in the well-ventilated cabin. A rear doggy door also allows for easy entrance and exit. 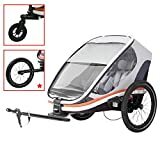 The feature set for this trailer includes a durable steel frame that holds animals up to 50 pounds, safety reflectors and a safety flag, 16-inch wide tires, an adjustable bug screen, and a universal coupler to attach to almost any bike. If your pet is a bit of a rascal in the trailer, the canvas might be susceptible to some damage. Besides that, the stability of this trailer goes down as the size of the pet increases, so be careful around those corners! Bike trailers are convenient and easy to use. Here are a few tips to make your bike trailer experience even better. When off-roading, use wide bike tires to prevent the trailer from fishtailing. Stability is especially important for safety when transporting children. Use a trailer to add some additional weight to your bike when training for a race. For the most efficiency in speed, choose a trailer with an aerodynamic design. A curved canvas and thinner wheels will cut through the air more efficiently. To increase the visibility of the trailer itself, select bright and reflective colors. This ups the safety factor and works well with other visibility accessories like a safety flag. If possible, use multiple trailers for multiple kids so that everyone is happy and comfortable. If you’re limited to a single trailer, make sure the interior is spacious with lots of room and organization for toys. Q: How does a bike trailer attach to the bike? Is it safe? A: This depends on the type of bike trailer hitch. Some attach directly to the frame of the bicycle, while others attach to the rear axle. Both types are safe and reliable. The axle hitch is a lot more convenient though since it works with almost any type of bike. Q: Will a bike trailer work with a suspension bike? A: Yes, it’ll work in most cases. Again, it depends on the type of hitch the trailer has, but most can be made to work. Choose an axle hitch for the best results since it’s less susceptible to damage when the rear frame flexes. Q: What’s the best kind of seat belt or harness design in a trailer? A: For the most safety, you’ll want a seat belt or harness that has multiple connection points. For example, a strap just across the legs or stomach isn’t as safe as a five-point design. At the very least, you’ll want a seatbelt similar to the ones in a car. Q: Can I use a bike trailer while mountain biking? A: Yes! To do this, you’ll need a specialty bike trailer that can offer a smooth and stable ride on the uneven terrain. In most cases, this type of trailer will only have one wheel and will attach to the bike’s frame for stability. Our overall top pick for bike trailers is the WIKE Moonlite Bike Trailer. It has tons of storage, great safety features, and an affordable price. If you’re looking for a great budget-conscious option, the Burley Design Bee Bike Trailer is our choice, thanks to its compact design and smooth ride. What’s your favorite bike trailer? How do our picks stack up? Let us know in the comments below!